Megiddo was an important Biblical city. The site is situated on the gateway on the road linking North and South of Israel, about 30 Km south-east of Haifa. The archeologists uncovered 26 layers of ancient cities. 1 Kings 9-15: "And this is the reason of the levy which king Solomon raised; for to build the house of the LORD, and his own house, and Millo, and the wall of Jerusalem, and Hazor, and Megiddo, and Gezer." The popular archaeological park is located 30Km south east of Haifa, and is located at a strategic entrance through the eastern Carmel hills where an ancient trade road (Via Maris) links the North (and Assyria) and South (Egypt). In this site an important City once flourished during the Canaanite and Israelite Kingdom periods, and mentioned in the Old Testament as a strong City that played an important role in the history of the Biblical Israel. It was abandoned after the Persian times since the site was relocated in nearby locations. 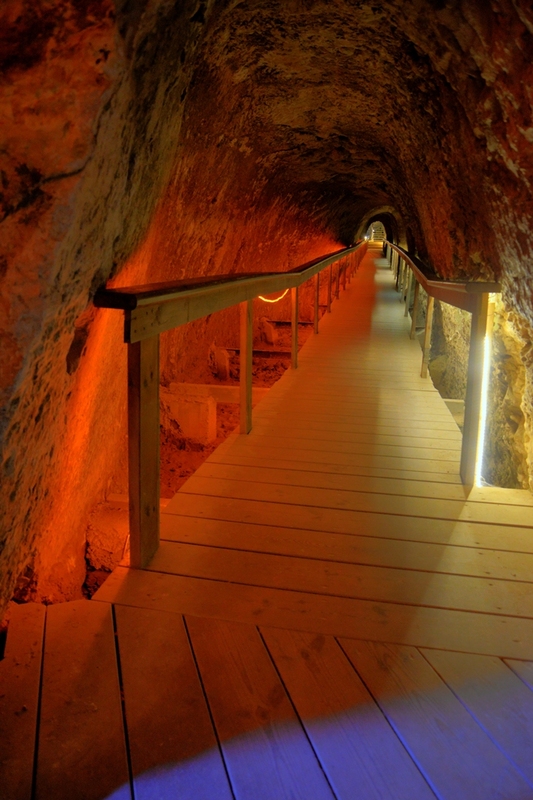 This left the foundations of the city virtually intact from the biblical times. 18Th C BC A new gate is constructed in the north side. 15th C BC The gate and walls were rebuilt. The city rebelled against the Egyptians with other Canaanite cities, and was conquered by Thutmose III after a great battle and a 7 month siege (1468). Also mentioned in the Amarna letters, a 14th century BC Egyptian archive of clay tablets. The city was captured by the Assyrian King Tiglath-Pileser III. Megiddo became capital of the Assyrian province of the Galilee. The Egyptians replaced the Assyrians. Kibbutz Megiddo was established on the south side of the Tel. 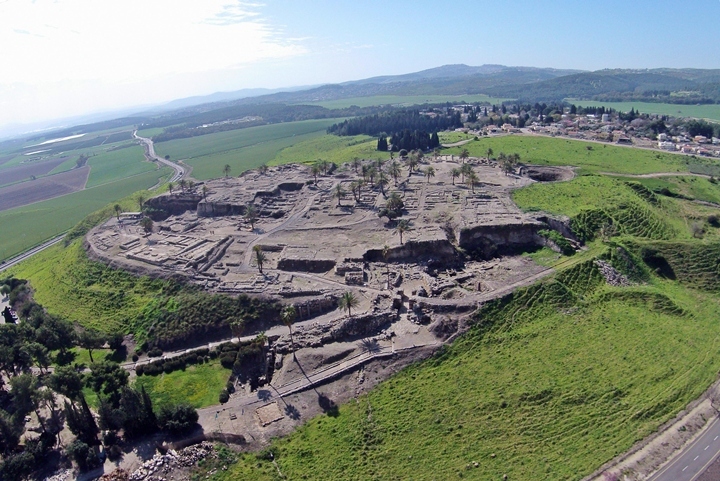 This drone photo shows an aerial view of Tel Megiddo, as captured from the north. The city gates are located in front side. In the right side of the city are the south stables and the water works. On the left background is the Jezreel (Yizreel) valley. On the far right background is Kibbutz Megiddo. Behind it is the mountain pass which this ancient city once commanded. 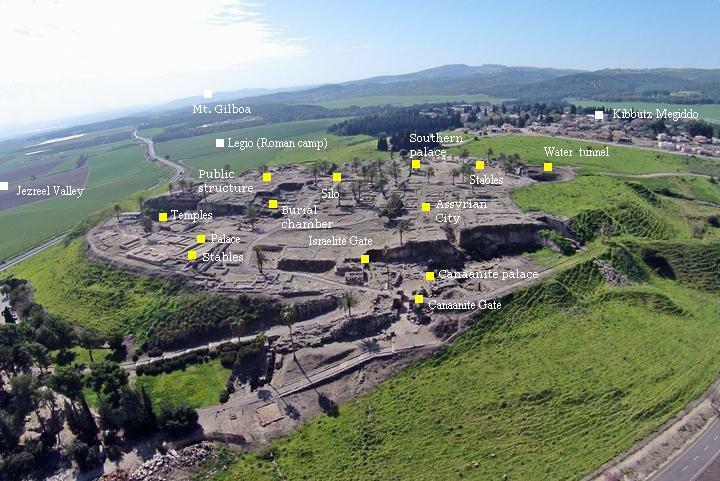 On this aerial view are points of interest of Tel Megiddo. You can click on the yellow squares to branch to the description of the place. A model of the ancient city is shown in the visitors center, from the same view point as in the aerial view . This model shows the Israelite period, while the earlier periods lie below and could be raised by pressing a button. The north gate is seen in the front side. In the right-back side are the south stables and the water works. The following sections are numbered according to the index of points of interest as appear in the National Park guides, starting from (2) to (20). The entry to the city was from the North side. There are 2 gates that can seen here: the lower level from 15C BC (Late Bronze - Canaanite) and the upper level from 9th century BC (King Solomon). 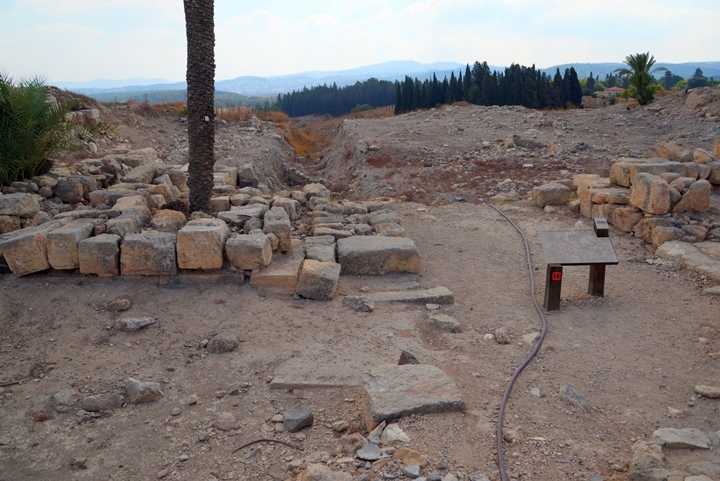 A third gate from the 18th century BC (Middle Bronze) was located south to both gates. The earlier gate from 15th century BC (late Bronze period) is seen in the photo below. It was incorporated into fortifications from the Middle Bronze (2200-1550BC). The gate consists of two rooms on each side, where the soldiers guarded the entrance. In the inner side of the inner rooms stood massive doors. 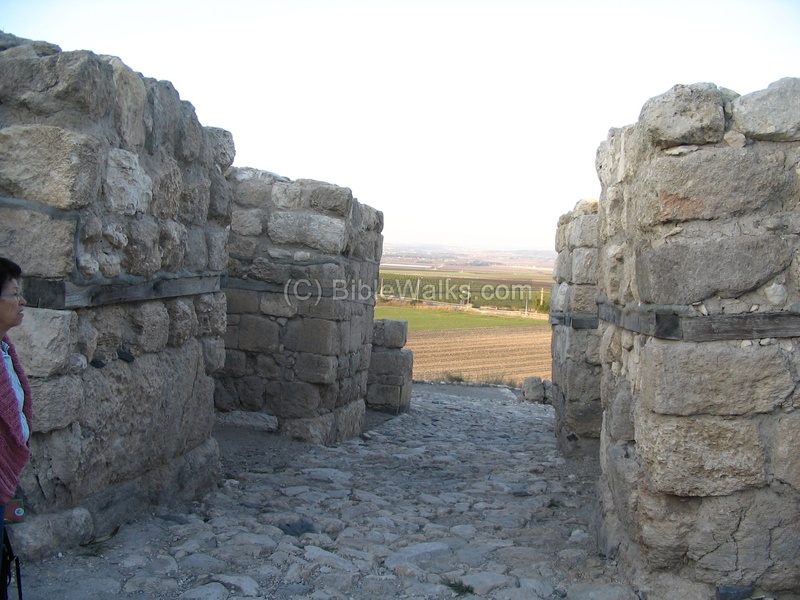 Next is a view from the other side of the Canaanite gate. At that time the city was under the rule of the Egyptian pharaohs. This city gate and the palace right behind it are the best remains from that time. The wooden black line is the level of preservation - under it were the actual ruins that were revealed during the excavations. 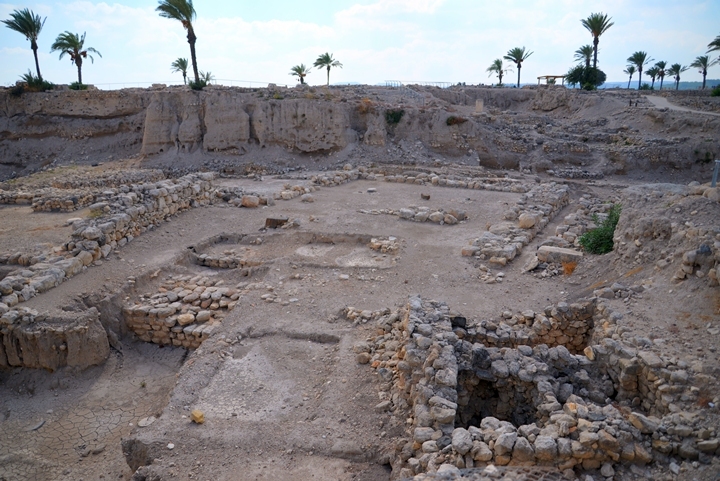 Behind the Canaanite gate was the Canaanite palace, dated to the Middle to Late Bronze periods. It was destroyed at the 12th century BC. 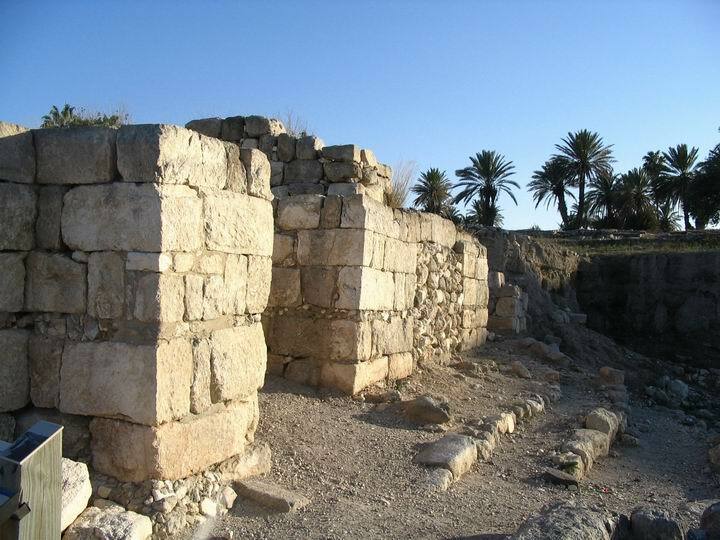 The thick 2m wide wall seen here is what remained from the palace. The black basalt steps were part of the street that ascended to a plaza in front of the palace. The area of the palace was 30m by 50m. Its plan was an open central courtyard surrounded by rooms and smaller courtyards. In one of the rooms the archaeologists unearthed a collection of hundreds of carved ivory artifacts. 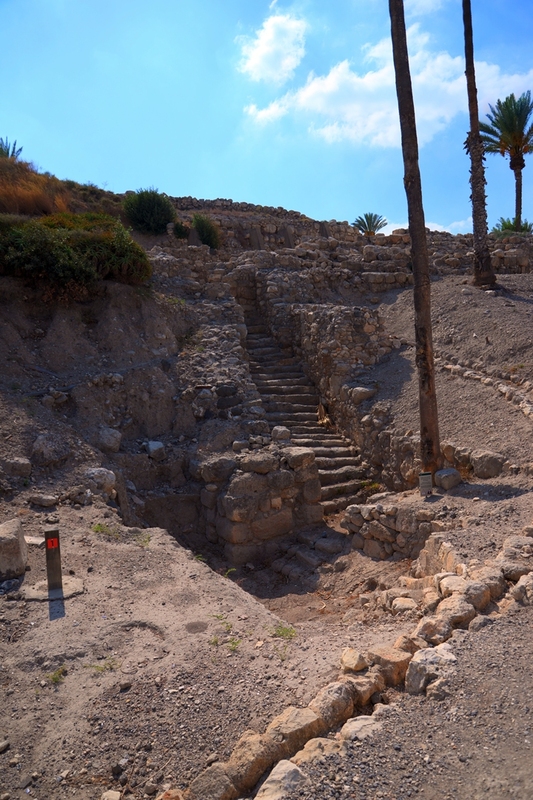 On the same north side, but at a higher level, is gate from a later period - the 10/9th century BC (Israelite Kingdom, Iron age). In the photo below only the eastern side of this gate is seen, since the western side (on the right side) was removed during the excavations. The gate, which was covered by a roof, had 6 chambers - 3 on each side. The middle chamber was not excavated and is filled with stones. The gate was built by King Solomon (10th century, according to some scholars) or Ahab, or Jeroboam II (9th century BC). This massive gate was actually the city inner gate. Two towers flanked the covered entrance. Between the inner gate and the outer gate was an 'L' shaped courtyard. This is illustrated on the section of the model on the right. The entry road ascended from the north side of the city, passed thru the external gate, entered to the courtyard, then thru the inner gate into the city. A staircase, seen in the photo below, connected the external gate to a water reservoir. 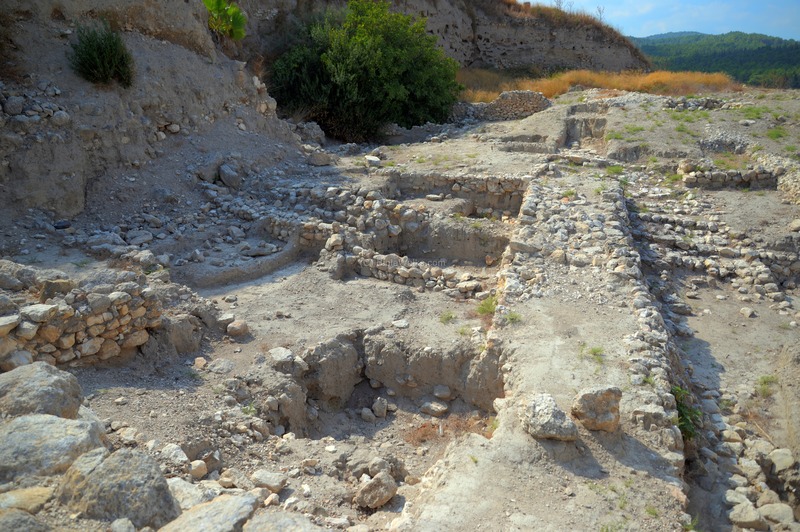 On the north side was a complex of 12 horse stables, dated to the 8/9th century BC (Israelite period). Remains of the north most stable, with stone pillars and troughs, are seen here. 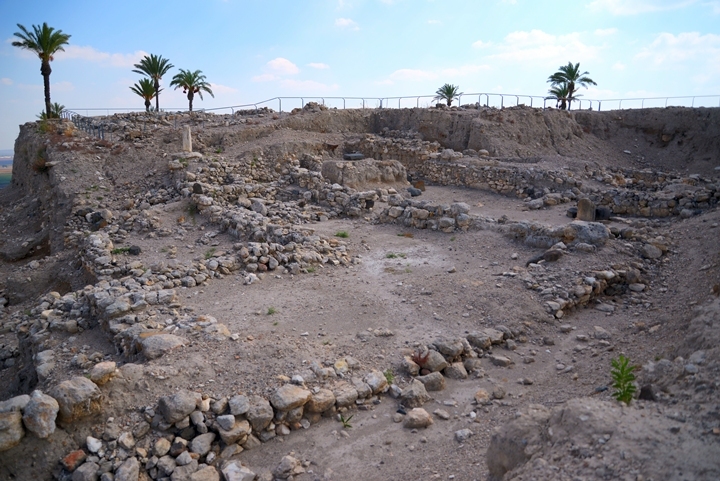 The remaining stables on the south side of the complex were removed to dig into the earlier Canaanite period. 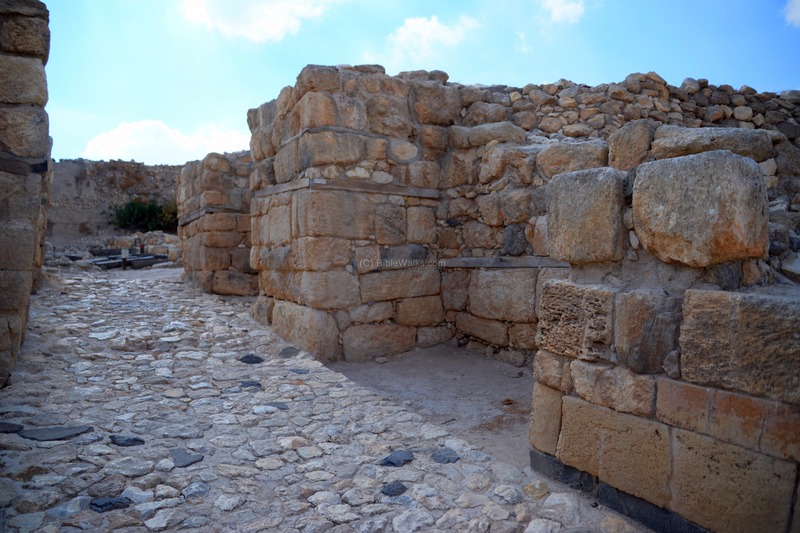 The stable walls were built with mud-bricks over a foundation of large square cut stones. 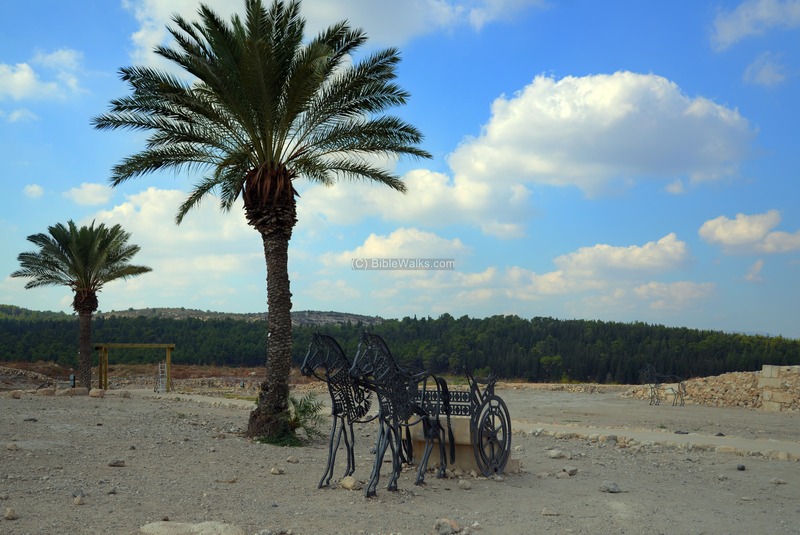 Horses and chariots were important factor during those times, and Megiddo was an important "Chariot city". The Bible expressed the might of king Solomon by the huge number of horses that his army had (1 Kings 4:26): "And Solomon had forty thousand stalls of horses for his chariots, and twelve thousand horsemen". Note that other scholars consider the stables to actually be storage rooms. However, there are many signs that support the theory of the stables, and may be one of the most important evidence of King Solomon's structures in Megiddo. 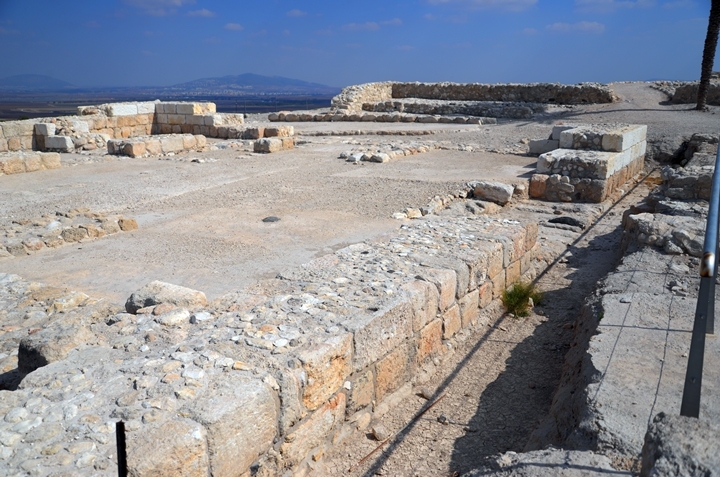 In this area is also the location of the northern palace, an earlier structure that was found under the stables. Its base is seen here from the south side. The palace was built during the early Israelite Kingdom, either during King Solomon's times (middle of the 10th century BC, as suggested by Yigal Yadin) or up to the times of King Ahab (beginning to middle of the 9th century BC). 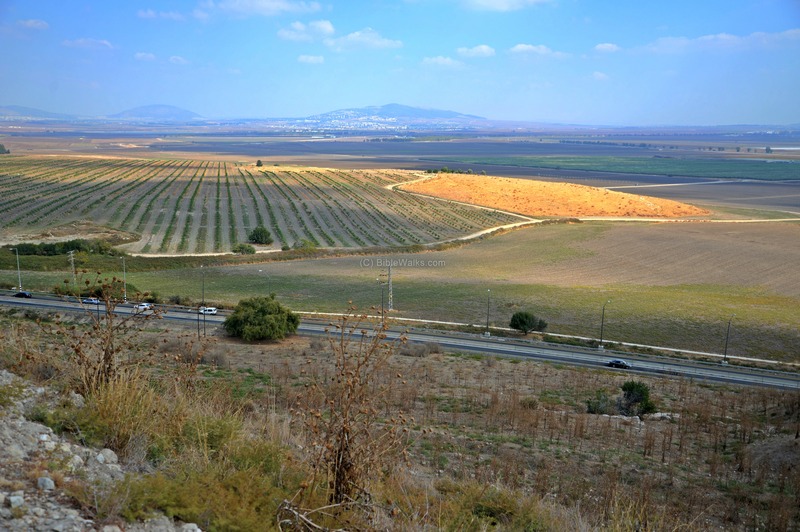 In the background is the hill of Givat Hamoreh (and Naim) in the center background, and Mount Tabor on the left background. Another view from the east side is next. Mount Carmel is seen in the far background. 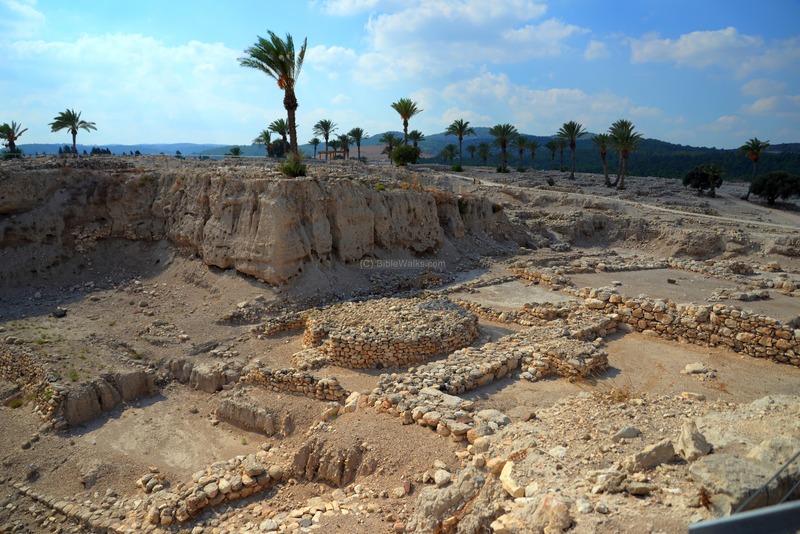 In the east side of Tel Megiddo is an area where a total of 17 temples were built in the course of 2,000 years of the city, starting from the early Canaanite/Bronze period (3300-2900BC) up to the Late Canaanite/Bronze period (1200 BC). 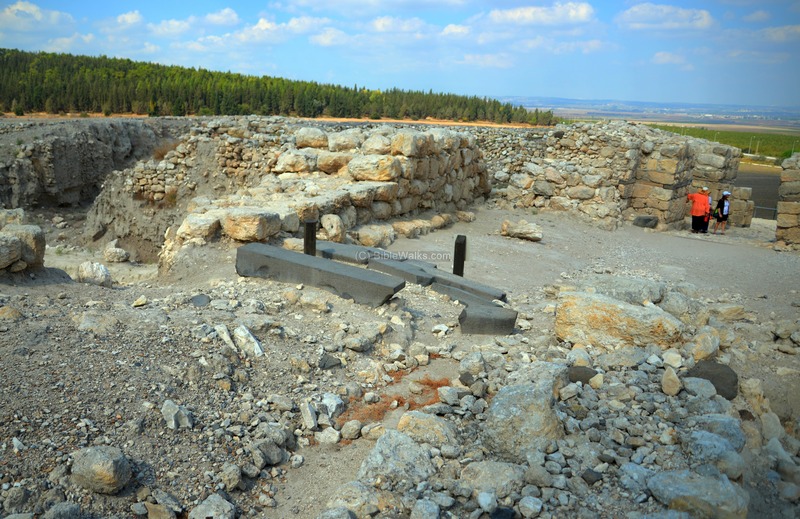 New temples were not added after the Israelite conquest. The next photo is a a view from the west side. 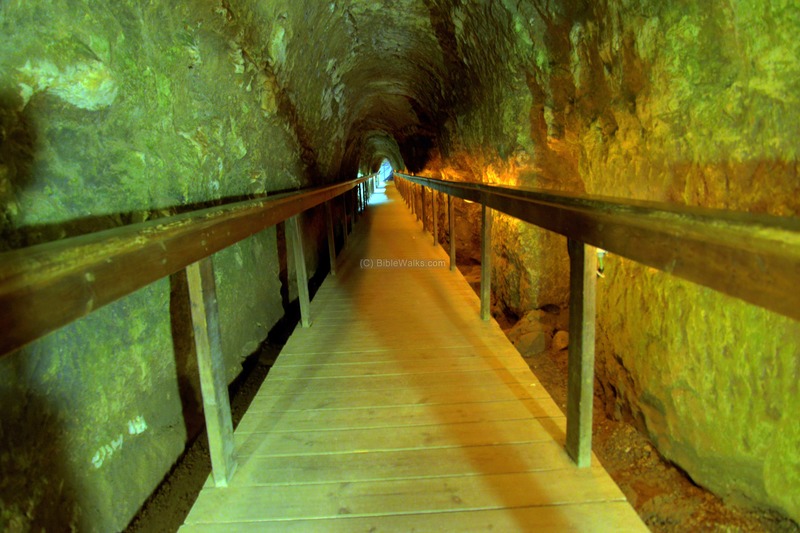 This deep trench was cut by the archaeologists in order to explore the different layers of Tel Megiddo. There are a total of 26 distinct layers of the city - starting from the Neolithic period (8300-4500 BC) on the hill's bedrock, up to the last layer of the Persian period (586-332BC). Each layer raised the height of the ground, thus increasing the height of the Tel from period to period. The next photo is a view from the northern observation point. 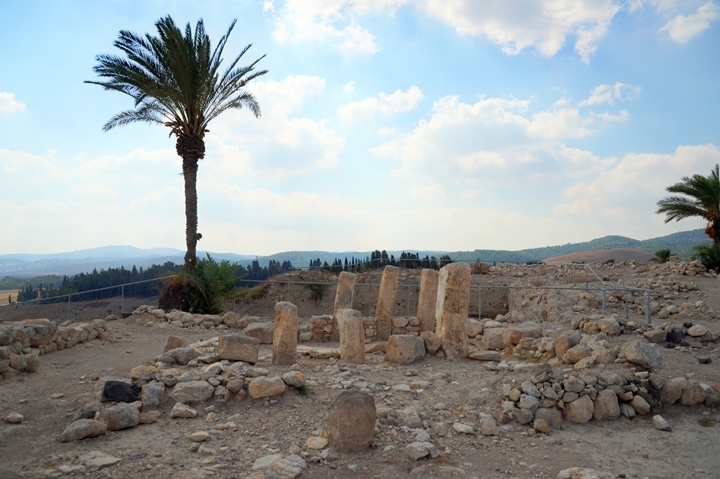 The round altar seen here is the temple on the lowest level - the first temple dated to the Early Bronze period. During the excavations the archaeologists peeled off temple by temple in order to reach to the oldest one. Another view from the south side is seen next. To the south of the temple area is another excavation area. 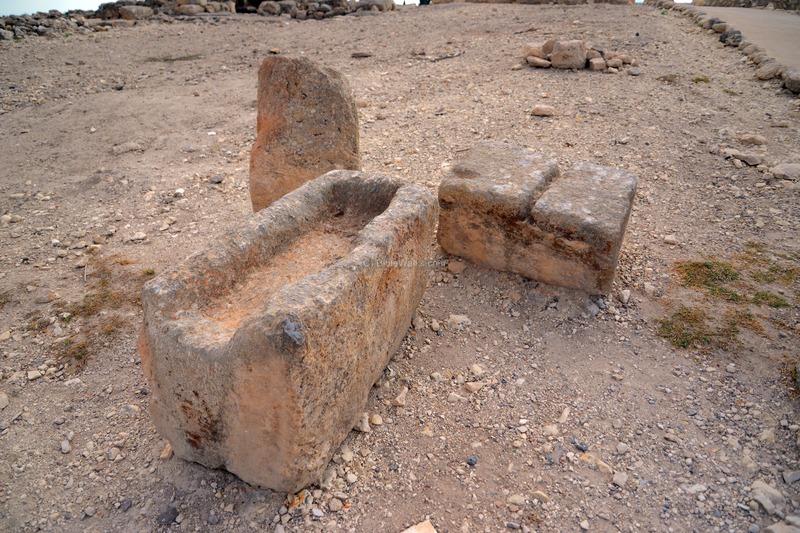 The major finding here was an impressive burial chamber named the "Aegean Tomb". It is an arched roofed structure, which resembles Aegean tombs in Greece, and dated to the Late Bronze or Iron Age 1 . Ruins of a public structure was exposed near the city walls. 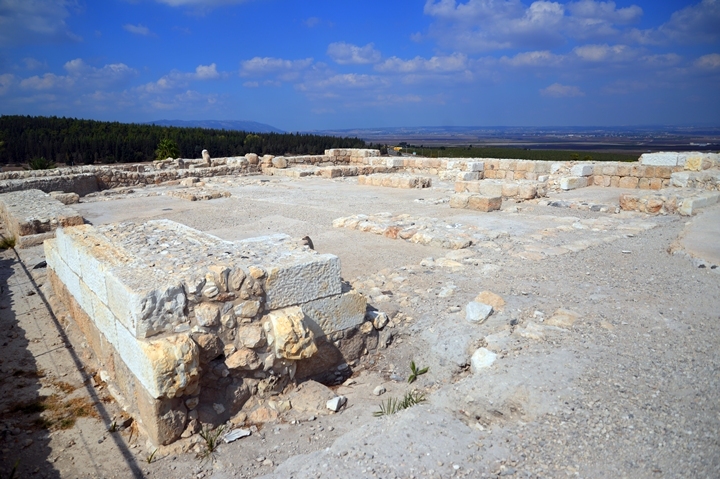 It was dated to the Israelite period, and may have served as an administrative building or palace. The walls are composed of fieldstones, with dressed corner stones. 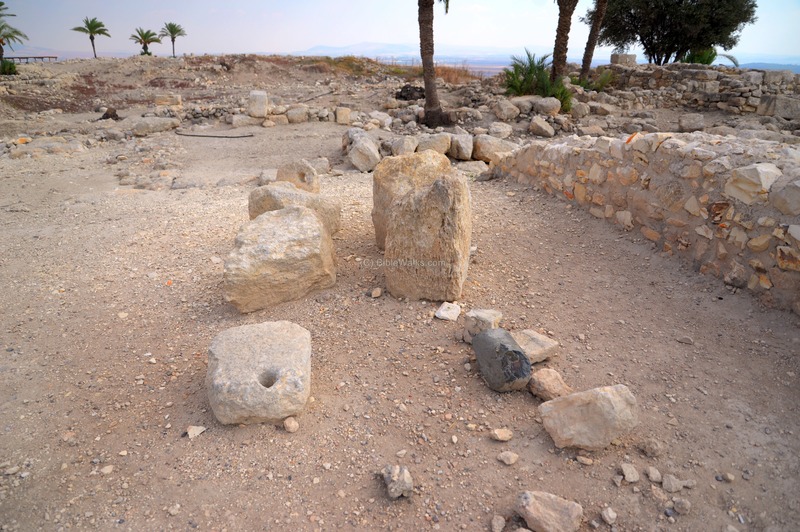 Seven capitals were unearthed, depicting stylized palm trees. 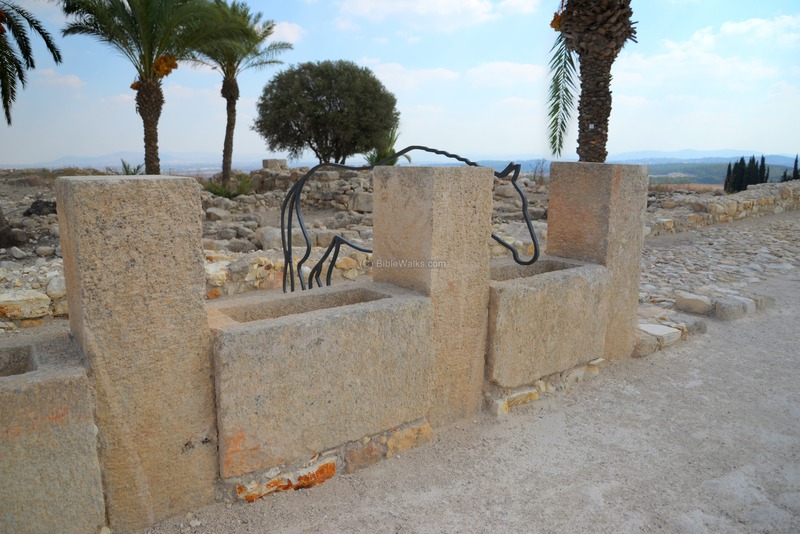 From the observation point are great views of the Jezreel valley around Megiddo. In the far background of this photo, from far left to center, are the hills of Nazareth, Mt. 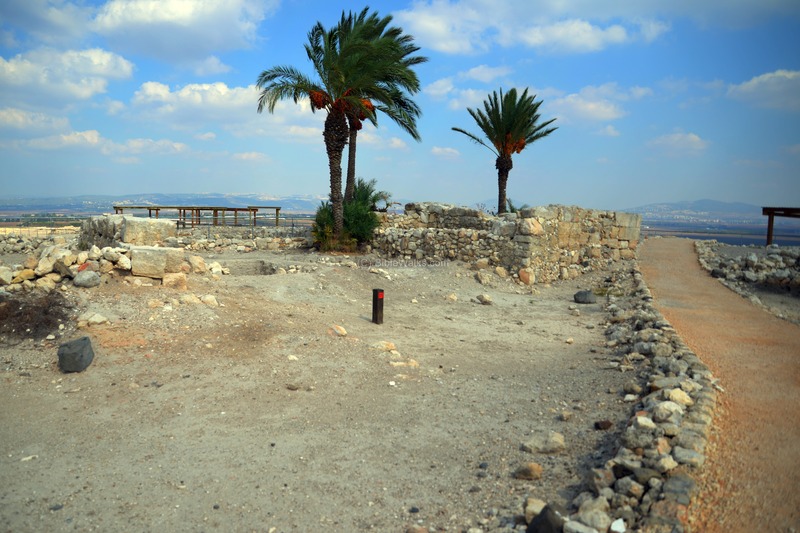 Tabor and Hamoreh (city of Afula). Embedded into the surface of the observation point are large dressed stones that were dismantled from the southern palace. On the ashlars are engraved mason marks. 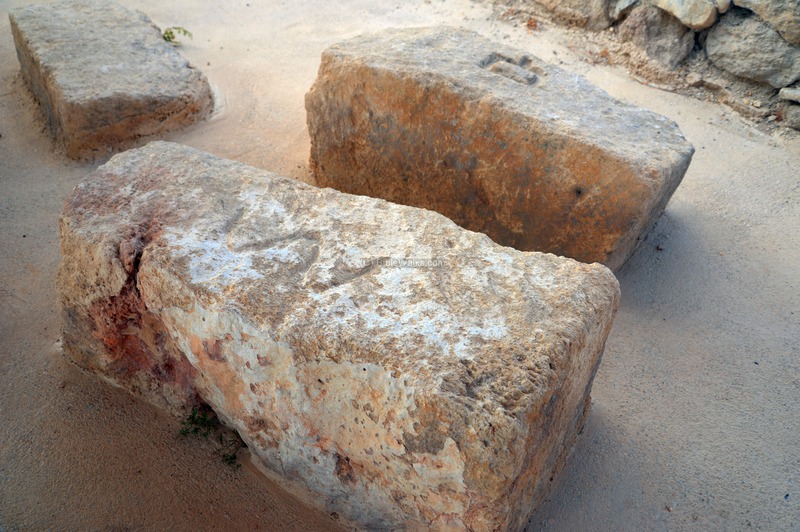 These marks are similar to those found in the 9th century Israelite palace in Samaria. 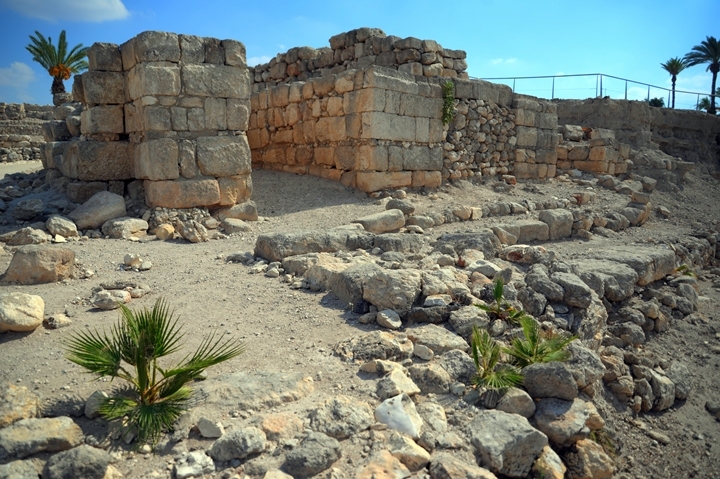 Near the southern observation point is a sample of the ancient houses of Megiddo. 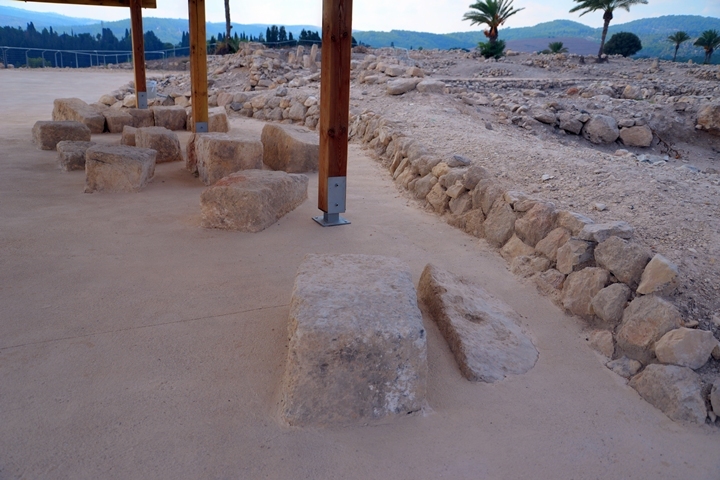 The two rows of three standing pillars are traces of an Israelite period dwelling. This is a typical house design of the Israelite period, named the "four-room house". It has three parallel spaces with a perpendicular space to them. 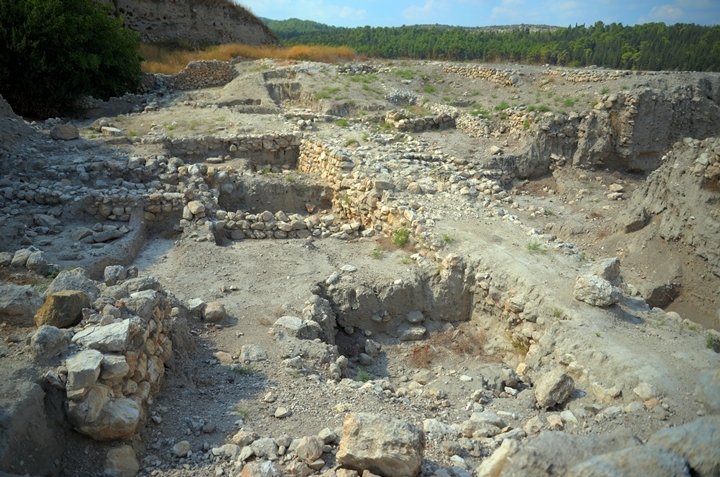 Farther south are remains of the Southern Israelite palace. Almost nothing remained of the palace, except for the base of the courtyard and gate, here on the front. During Schumacher's expedition, a rare seal was found near the outer gate of the palace. 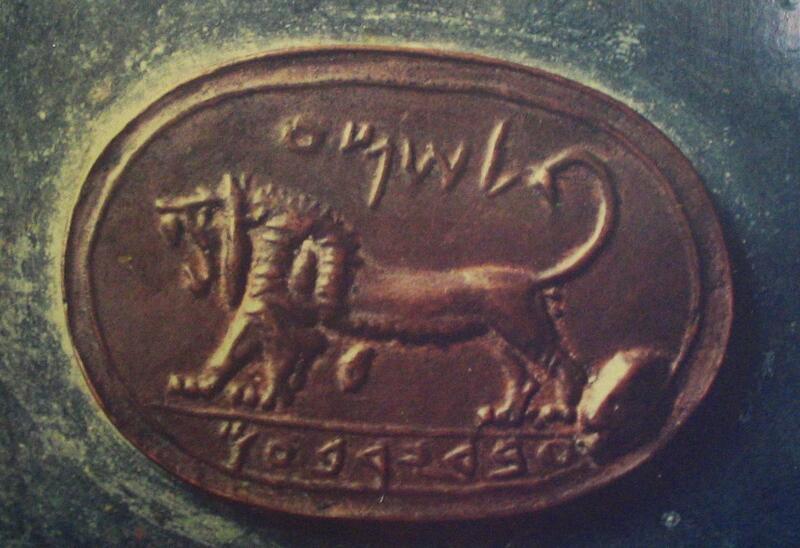 It bears and inscription: "To Shema slave of Jeroboam". This Jeroboam may have been King Jeroboam II from 750BC. 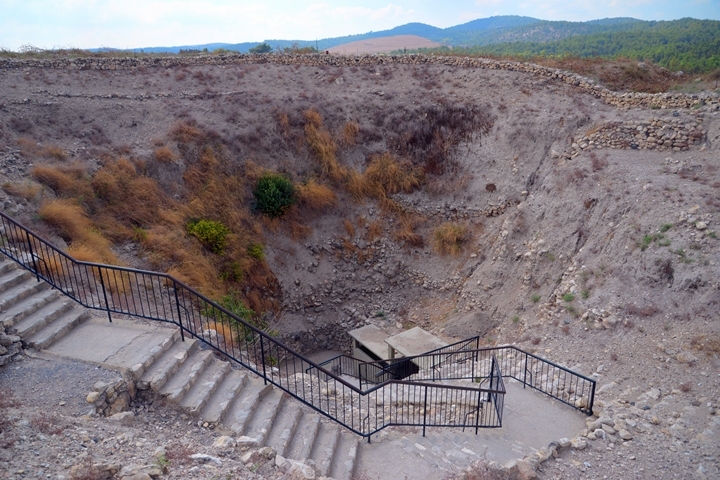 On the south side is a large pit, which used to be a grain silo from King Jeroboam II (8th century BC). 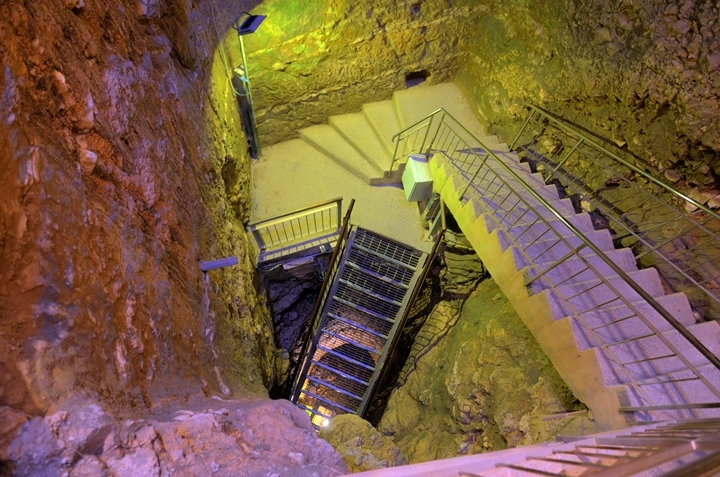 There are two spiral staircases that lead to the bottom of the pit, which is lined with field stones. The silo is 11 meters in diameter, 7 meters deep, with a total storage volume of 450 cubic meters. The bottom is paved by pebbles. The archaeologists found kernels of wheat and straw in the pit. Another view of the silo, looking east, is next. 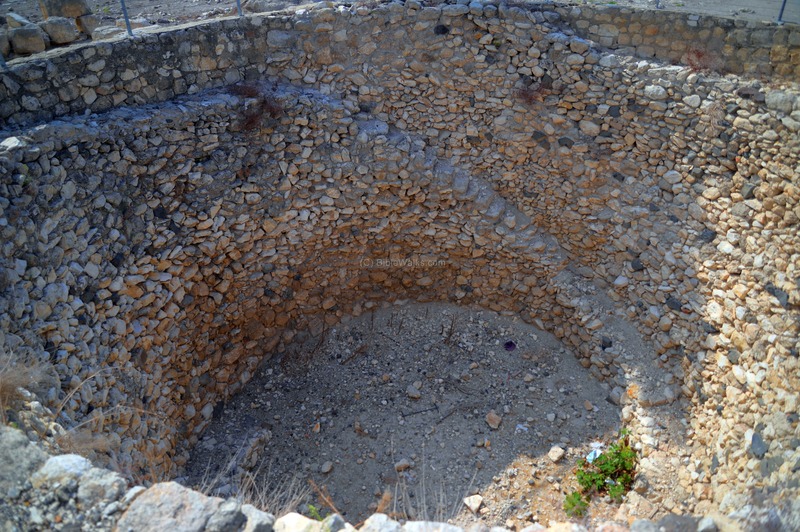 The silo may have been used either for the people of Megiddo, or for storage of dry hay or feed for the horses in the nearby stables. Another set of stables is located on the south side. The primary function of the horses was to pull two-wheeled or four-wheeled war chariots. The Chariots were one of the most important war machines at that time, and required to allocate much real estate within the city for the horses. 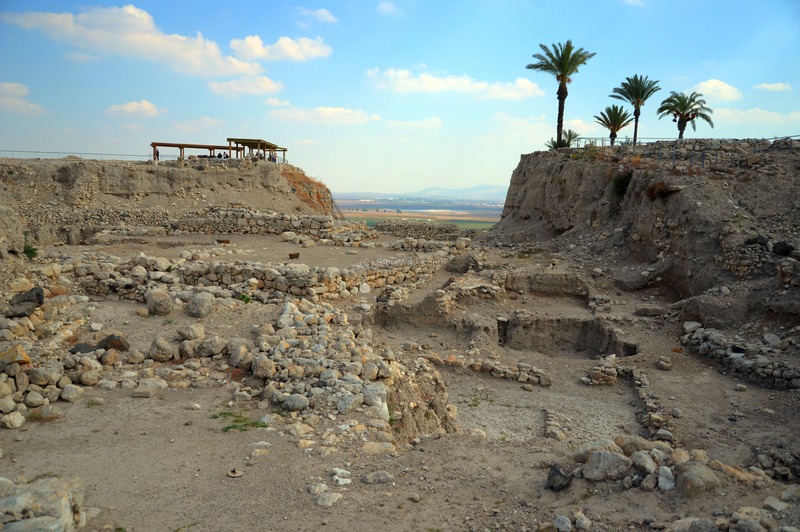 Indeed, Megiddo was a fortified "Chariot city", one of several chariot cities of the Judean Kingdom (see Bible references). King Solomon (reign 970-931 BC) had 1400 chariots and 12,000 horses, while Ahab used 2,000 chariots in his battle against the Assyrian King Shalmaneser III (853 BC). There were 5 stables in this complex, as well as 12 in the northern complex, with a total of 450 horses or more. One of the stables were reconstructed, and seen in the photo below. The plan of the stable was based on 3 long sections, separated by rows of stone pillars and troughs between them. The middle section was a long central hall, with side aisles flanking both sides of the hall. The central hall was wide enough to allow a cart to deliver the grain and hay to the troughs and turn around to the other side. The next photo shows several of the reconstructed stands in the stable, with the limestone pillars standing on both sides of each feeding trough. The side aisles are paved with cobblestone. The cobblestone pavement helped to toughen the hooves (tip of toes) of the horses, as the horses had no horseshoes during the Iron age. They were introduced only 2,000 years ago during the Roman period, after Iron became affordable. Some of the original stones stand near the entrance to the stable. The pillars have holes on the top side which were used to tie the horses. The stone pillars have teeth imprints on their upper side, as the horses used their teeth to bite the stone (crib bites). The feeding troughs have teeth imprints on the inner lip of their shallow cavity. In 732 BC was an intrusion into the North of Israel by the Assyrian King Tiglath-Pileser III, who annexed the area: (2 Kings 15: 29): "In the days of Pekah king of Israel came Tiglathpileser king of Assyria, and took ... Galilee...and carried them captive to Assyria"). 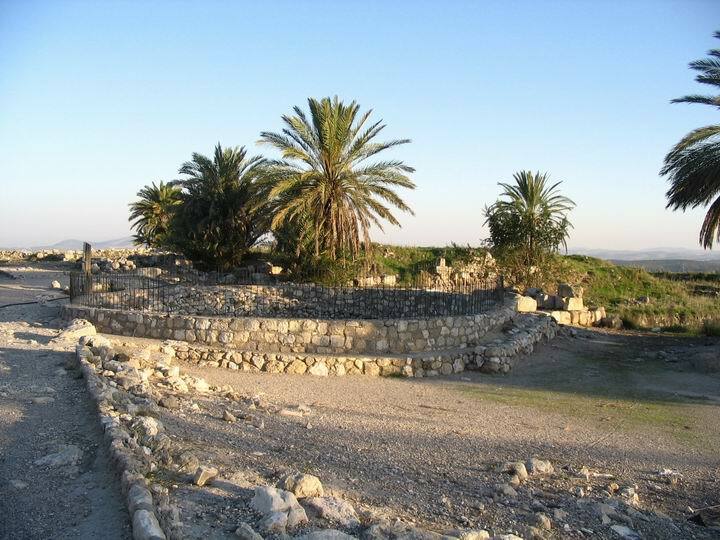 Megiddo then became the capital of the region under Assyrian rule. 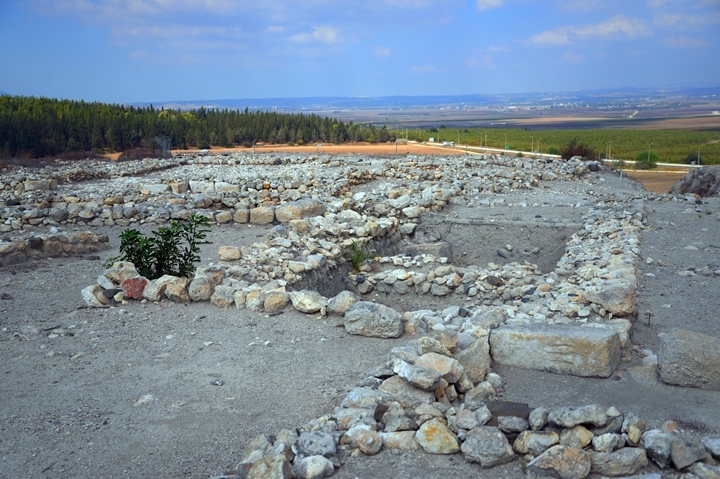 The city on top of the Tel was designed in a new orthogonal planning, which was new to the city and in the region. You can notice this order in the photo below, which is different from other sections of the Tel. One of the highlights of the city is its underground waterworks, located on the west side, which was built in the 10th century BC. 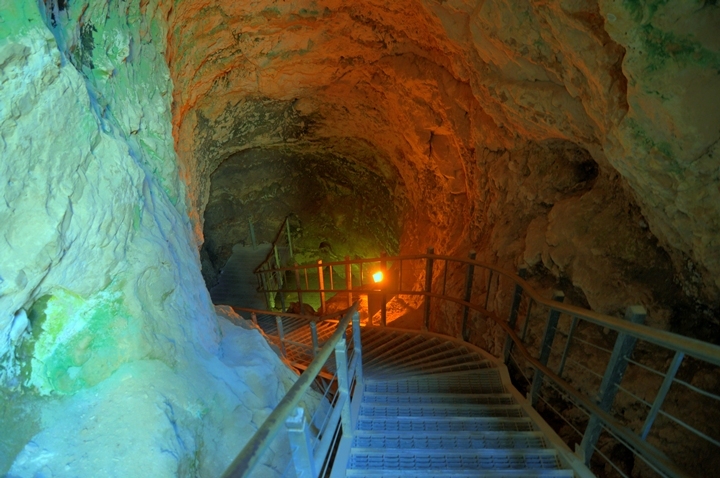 A large pit with 183 stairs led down 36M, and a 70M tunnel led to the spring under the bedrock. The spring was the source of water of the city and allowed it to survive long sieges. This system overcame a problem where the spring was initially located outside the walls, and the secret passage enabled the defenders to tap into fresh water without the knowledge of the enemy. During peaceful times the spring was also accessed from outside the walls, but during siege this entrance was blocked and camouflaged. Similar systems were constructed in Hazor, Jerusalem (the "gutter" as per 2 Samuel 5:8), Gezer and more Tels. The staircase first leads down into the vertical shaft. Then another staircase leads down to the lowest level. Then, a 70m long horizontal tunnel leads to the spring - the source of the water. The tunnel is inclined such that the waters would flow from the spring to the bottom of the shaft, so the water could be drawn from the top of the shaft. The outer entrance to the spring was concealed and buried under a stone wall, thus protecting the water system from the outside. 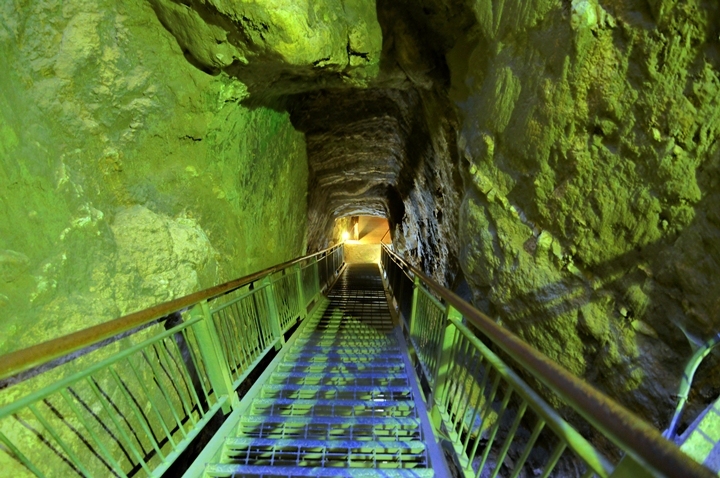 A staircase was added in order to let the visitors to exit the water system, either to a bus or car waiting at the nearby parking lot, or by foot back to the visitor center. 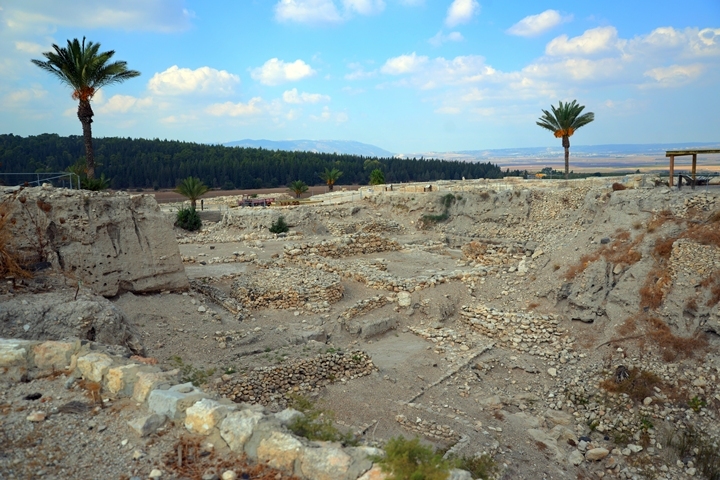 Megiddo is mentioned 18 times in the Old Testament. The following texts are selected references. 12 Yet the children of Manasseh could not drive out the inhabitants of those cities; but the Canaanites would dwell in that land." Only later, during King David's times, the city became part of the Jewish state. 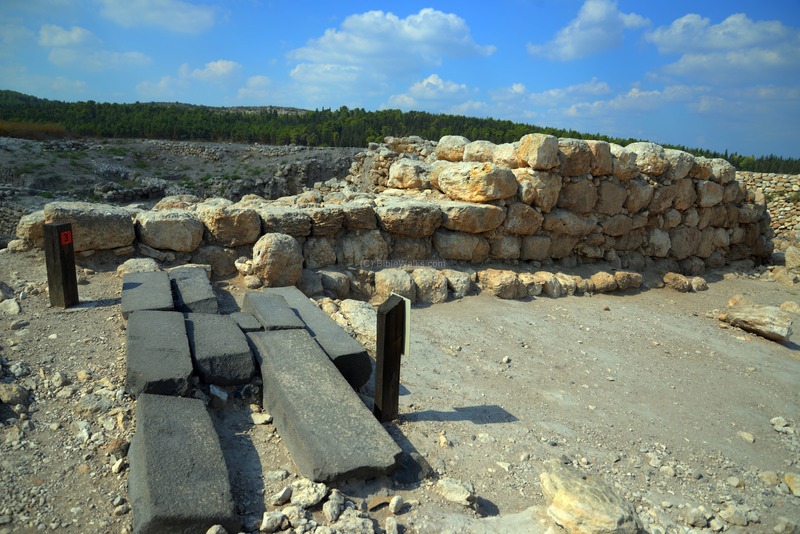 His son, King Solomon, constructed the great walls, including the famous gate which was later unearthed by the archaeological digs. "And this is the reason of the levy which king Solomon raised; for to build the house of the LORD, and his own house, and Millo, and the wall of Jerusalem, and Hazor, and Megiddo, and Gezer." "And Solomon had forty thousand stalls of horses for his chariots, and twelve thousand horsemen". 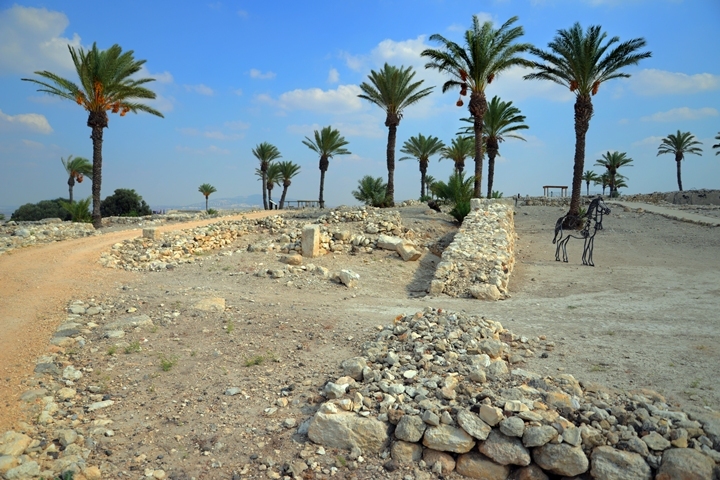 The Assyrians captured the Galilee (732 BC), and made Megiddo the capital of the region. 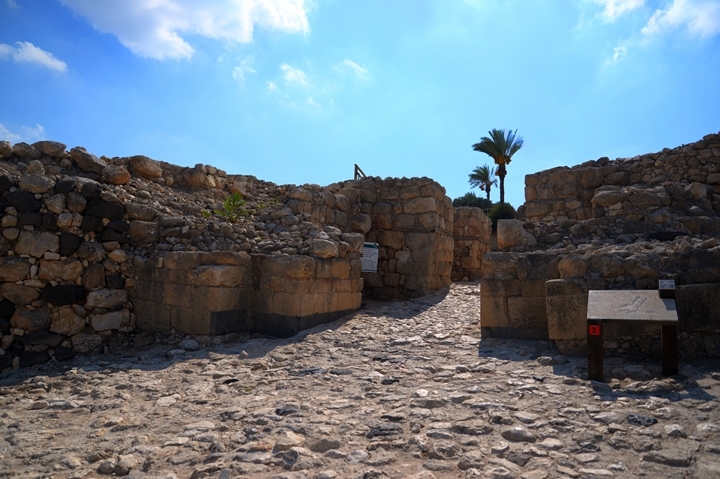 King Josiah tried to block the armies from Egypt to pass through Megiddo, but was defeated there (year 609BC) which was a terrible tragedy for the Jewish state. "In his days Pharaohnechoh king of Egypt went up against the king of Assyria to the river Euphrates: and king Josiah went against him; and he slew him at Megiddo, when he had seen him." There is no doubt on the fact that this Tel is indeed the true site of Megiddo, although the Arabic name of the hill did not preserve the name. 1903-1905 (Gottlieb Schumacher), which uncovered 20 layers, including Jeroboam seal (seen on the right), Egyptian ivory and other artifacts. 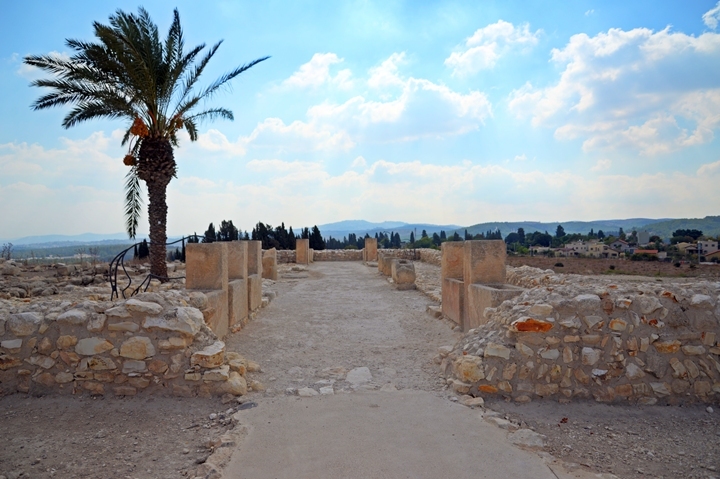 Megiddo - referred in many texts in the old Testament. The source of the name is not clear. 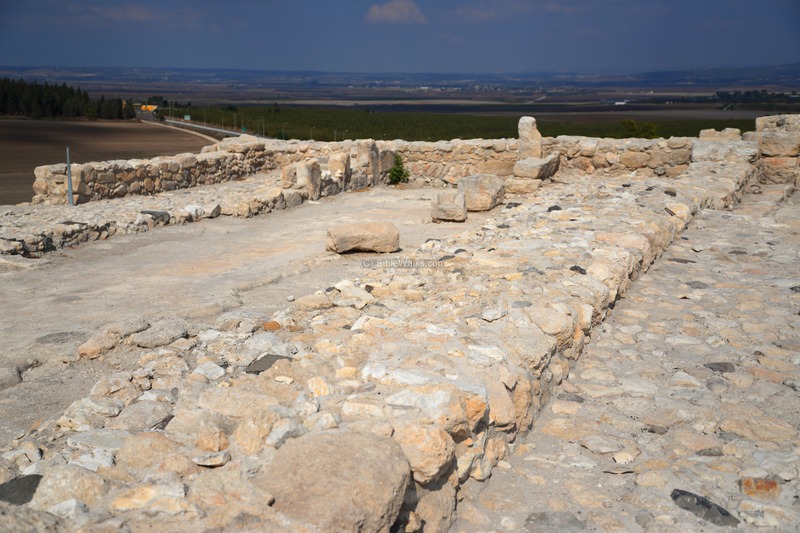 Perhaps it is based on the root G-D-D, or Gdud, meaning: battalion (a great army was stationed here), or a mound (the city was built on an impressive mound). Learn about the story of a Tel in the info page.